After gaining wide popularity on Instagram for sharing inspirational and humorous posts about his everyday life with his wife and children, Khalid Al Ameri started “Meet The Al Ameri’s.” This vlog features Khalid and his wife Salama, and their two children, Abdullah and Khalifa. 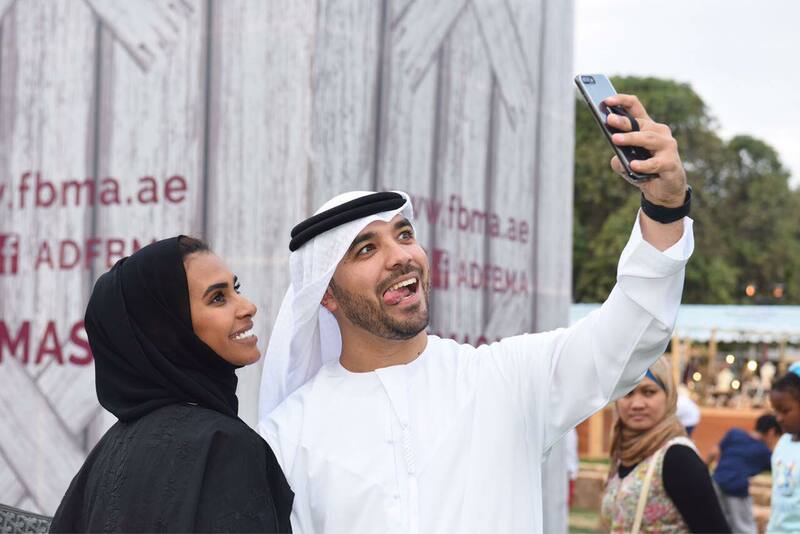 After gaining wide popularity on Instagram for sharing inspirational and humorous posts about his everyday life with his wife and children, Khalid Al Ameri started “Meet The Al Ameri’s.” This vlog features Khalid and his wife Salama, and their two children, Abdullah and Khalifa. It gives viewers an inside look into the interaction between the Emirati couple and their children. Khalid, who quit his job to “write and make videos,” is an MBA graduate from the Stanford Graduate School of Business. He worked previously in global investments from Abu Dhabi, and is currently a social columnist with The National as well as a youth coach. AGSIW spoke with Khalid to get to know more about how he started his career in media, how “Meet The Al Ameri’s” came about, and what trends exist among young Gulf families on social media. AGSIW: Your first introduction to the public was through your writings as a columnist for The National. What made you shift your focus toward more video content and social media? Khalid: I am still an active columnist with The National. That is how I started my career in media and I predict that I will live the rest of my life writing columns, sharing thoughts, and tackling taboos and social issues in the Gulf region. I think my transition to more video content and social media was inspired by my early memories as a kid. I would take part in school plays as a kid and I’ve always felt that I wanted to be on TV, go to Hollywood, and become an actor. As an adult, the beginning of my career on stage started by presenting for government events. I then moved to Snapchat, which is fairly recent. On Snapchat, what I would do is share things like: how I got into a good university; what are the biggest mistakes I made in my career; what happened when I quit my job; what are great things about being a freelancer; what three things I would advise new couples to do; etc. AGSIW: There are plenty of topics to could discuss on apps like Snapchat and Instagram. Why did you specifically tailor your posts to reflect your experiences about your career and relationships? Khalid: For me, it was always a matter of supply and demand. There was, and until now is, no supply of content like this in our region. When I got married, I was looking for advice but couldn’t find people who shared their experiences with others. You have kids not knowing what they want to do when they grow up; you have new graduates going into job interviews and not being able to communicate with their interviewers. I felt that there was a lot of demand from youth about what to do when it comes to their careers and relationships, but no supply. No one is sharing their experiences, and by that I mean young Emiratis or khaleejis. AGSIW: What compelled you to start “Meet The Al-Ameri’s” on YouTube? Khalid: I wanted to share more and be more intimate with the audience. Salama and I were already doing stories on both Instagram and Snapchat and people would always say they wanted to learn more from our experiences. The goal is to allow people to learn more from us and be entertained by the dynamic of our relationship with each other and our kids. We wanted to be different than what we traditionally see on social media; we wanted to do more. I wanted to show people our day about doing something and how we interact. I wanted to give people an insight about who we are as a family and how we live our lives. That is our main goal. Most of “Meet The Al-Ameri’s” revolves around Salama and I and little bits of interacting with our kids. Our kids are not the main attraction of the channel as we are very careful with that. AGSIW: While Gulf societies are now more open to people sharing personal details, there remains a concern for privacy and wanting to keep intimate details to oneself. Was this ever a concern for you or your audience given the sensitive nature of some of your posts? Khalid: Of course, it was a concern not for me but for other people who would comment with things like “You shouldn’t be sharing these things about your family …” But if we look at the numbers, they are only 5 percent of the overall responses. But they are very loud; as you know the negative things stick out more. I think some people weren’t uncomfortable as much as they disagreed with the fact that I was sharing pictures and videos of myself, my relationship with my wife, and the kids. They think it is not appropriate. AGSIW: There is an increasing number of young Gulf families using social media to share details about their everyday lives, like the Al-Mallaks from Kuwait and others. How do you view this change among young couples in the Gulf? Khalid: I think it is amazing. We need more people like this on the Internet. Whenever I would share something I would get direct messages from a couple together saying, “Thank you. We just talked about an article or a post you shared about how you and Salama got past your first year of marriage happily and we’re taking some of that advice.” I got a picture from a couple showing me that they are holding hands in reaction to an article I wrote. If couples are sending me pictures of themselves going on a date night because of a column I wrote about the importance of a weekly date night, this whole “tradition versus love” thing is not going to hold weight because it doesn’t make sense. People want to be happy and it is something that people want to watch. In our culture, what gets me very angry and emotional is when people look at a man harassing a woman and don’t do anything about it, just becoming normalized to it. But if you see a man in public hugging his wife, that’s an issue. This is fundamentally flawed. To watch episodes from “Meet The Al Ameri’s” check out Khalid’s YouTube channel. And to stay connected with Khalid and read his latest posts, follow him on Instagram and Twitter. AGSIW spoke with Hadil Al-Moosa about media in Oman, labor laws, women’s entrepreneurship, and the role of government support for entrepreneurs. is a former research associate at the Arab Gulf States Institute in Washington and a regular contributor to Millennial Gulf.